ASHEVILLE, N.C. (AP) Venus Williams used her 1,000th career singles match to get the United States off to a strong start in its Fed Cup title defense. CoCo Vandeweghe needed to stage a comeback to make sure that momentum continued. 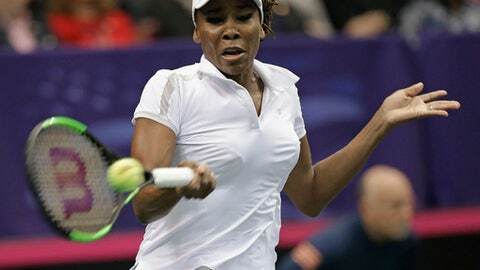 Williams and Vandeweghe won their singles matches Saturday to give the U.S. a 2-0 lead over the Netherlands. One of those matches proved much closer than the other. Williams beat Arantxa Rus 6-1, 6-4 in to improve her career singles record to 776-224. Vandeweghe had to rally from a set and a break down to win her match 4-6, 7-6 (6), 6-3 over Richel Hogenkamp. Vandewegh, who hadn’t played since an Australian Open first-round exit, lost seven straight games at one point and fell behind 3-0 in the second set before rallying to beat the 108th-ranked Hogenkamp. Sunday’s Fed Cup action features the return of Serena Williams after more than a year away from the game while becoming a mother. She and Lauren Davis are scheduled to face Lesley Kerkhove and Demi Schuurs in doubles. Serena Williams gave birth to her daughter Sept. 1 and hasn’t played competitive tennis since winning the 2017 Australian Open while pregnant. If the U.S. wins its first singles match Sunday to clinch the victory in this best-of-5 event, Sunday’s second singles match would be scrapped but the doubles match would still go on. Sunday’s schedule currently has Venus Williams facing Hogenkamp and Vandeweghe taking on Rus, but both captains still have time to make substitutions. In Saturday’s first match, Venus Williams broke Rus five straight times to overcome a shaky serve. Williams and Rus exchanged service breaks in the first five games of the second set, with Williams grabbing a 3-2 lead. Each player held serve the rest of the way as Williams improved her overall Fed Cup singles record to 20-2. Vandeweghe had a much more frustrating time. After having her serve broken early in the second set, Vandeweghe tossed her racket onto the hard-court surface, picked it up and slammed it near the net, then headed to her chair and slammed her racket again. Vandewegh turned things around from there and overcame 12 double-faults to continue her recent Fed Cup success. When neither Williams sister played in the Fed Cup last year, Vandeweghe led the U.S. to its 2017 title by going 6-0 in singles matches and 2-0 in doubles. She became the first American ever to win six Fed Cup singles matches in one year since the World Group format was introduced in 1995. In other World Group Fed Cup series, the Czech Republic leads Switzerland 2-0 while Belarus-Germany and France-Belgium are 1-1.